The books central thesis in its most concentrated form (namely., the Orion Correlation theory as it is implemented in Arizona) is found in Chapter 2. 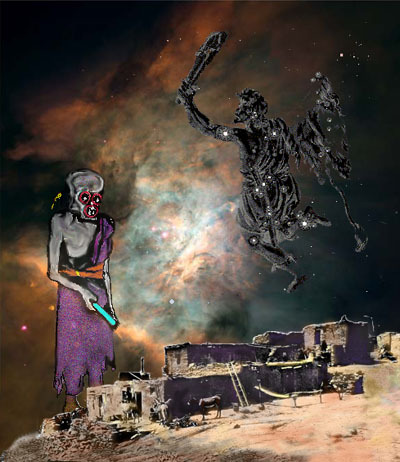 The first chapter researches the character of the Anasazi, while Chapter 3 inquires into the mythological significance of Orion according to the various cultures around the world, including the Hopi, who associate the constellation with their god Masauu. Chapter 4 describes in greater depth the village and ruin sites corresponding to the belt stars as well as to the shoulders and legs. Chapter 5 deals with the effects on Anasazi culture of both a supernova explosion and a volcanic eruption in the 11th century A.D. It also discusses the Hopi stone tablets and a specific star map/solstice marker petroglyph. Chapter 6 enumerates the Arizona sites correlating to the head and arms of Orion; in addition, the chakra line is talked about in greater detail. Chapter 7 explains the Katsina (or Kachina) Phenomenon, especially the celestial beings, while Chapter 8 designates the companion sites to Orion in the Southwest, including Grand Canyon, Chaco Canyon, and Death Valley. Part II of the book begins with Chapter 9, which delineates the Hopi-Mesoamerican connection. We follow the chakra lines vector into the South Pacific in Chapter 10, delving into some surprising correspondences to the ancestral Hopi. Chapter 11 investigates the global Orion legacy, focusing upon the Orion Correlation at Giza and Egyptian influences on the ancient peoples of the Colorado Plateau. Chapter 12 involves the Phoenix stargate, the ancient Hohokam, and the Masonic heart of Aztlan. Finally, Chapter 13, the most far-reaching in the book, explores the stunning implications of the Serpent People (i.e., the Knights Templar), Hopi prophecy of the End Times, and the Ant People from Orion. Copyright © 2000-2005 by Gary A. David. All rights reserved.